Traditionally, plumbing is concerned with the supply of water and drainage. However, today's plumbers also deal with heating systems, domestic appliances such as washing machines, and joints and flashings for external areas. There are many potential plumbing catastrophes in the average home. Perhaps the most worrying is a blocked drain or toilet, as it often brings some truly terrible cleaning up! After calling a plumber, make no attempt to flush the toilet in the hope that the blockage will clear. It almost certainly won't. The plumber will use drain rods or plungers to clear the obstruction, and may resort to the use of powerful chemicals to ensure that the drain or toilet is completely clear. To avoid a recurrence, ensure family members avoid using too much toilet paper and also make sure that nothing other than toilet paper is flushed along with the human waste. Also beware of loosely-fitted plastic toilet fresheners – a common cause of toilet and drain blockage. 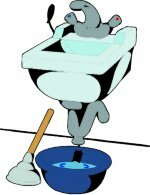 Should your sink become blocked, be wary thereafter of how much food is allowed to go down the drain when washing up. Leaks are another common disaster, and are especially distressing when they occur upstairs in a property. 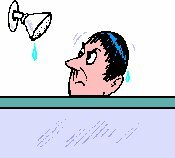 As soon as you become aware of a leak, switch your water off at the mains. Open all the household taps so as to drain the water system. Call a plumber, and use mops, buckets and cloths to clear up as much water as possible, before it causes significant damage. If a ceiling is bulging with leaked water, you should make a hole in it and drain that water out, before it causes the ceiling to collapse completely. One of the commonest causes of leaks is a nail being hammered into the wall and straight through pipe work. If this happens, do not extract the nail - leave it to plug the hole and switch off the water at the mains. A plumber should be able to remove a small section of wall covering to repair the damage. Broken sanitary ware can represent a plumbing emergency when it leads to leaks, and if the broken item is crucial to daily life (the only bath in the house, for example). A professional plumber will often be able to source a match to the rest of the existing fixtures, but this is not always possible. This is an area in which home insurance cover can be crucial, as depending on your policy, your insurance may cover you for an entire replacement bathroom suite if the replacement item cannot be matched to the rest. If the external water mains burst look in the road to find the mains control and turn it off; this may also turn off the supply to neighbouring properties. 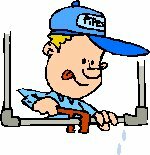 Your plumber will be able to help you resolve the problem if necessary. Pipes leading to the mains control will belong to the water board and will be their responsibility. If you are on a water meter, pipes between your property and the mains may be your responsibility. One of the best ways to source any tradesman is by word of mouth. Ask family, friends or neighbours for recommendations. Your local Trading Standards department may also have a list of approved tradesman and many companies will offer testimonials from satisfied customers, and some even place these on their website. You can check a plumber's qualifications and, should you need a plumber to undertake gas work, you must ensure that they are Corgi registered. 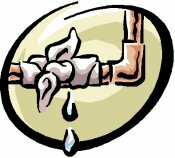 Your plumber must have public liability insurance and you can ask to see a copy of their insurance certificate if you are in any doubt.